Atlantic Gold & Silver Buyers is located in the Galleria Shopping Center at 9600 N Kings Highway at the corner of Lake Arrowhead Road, Myrtle Beach, SC and specializes in the purchase of precious metals including gold, silver and platinum. Atlantic Gold Buyers is licensed in South Carolina to buy all your precious metals. It’s our goal to provide you with a safe and relaxed environment for all your precious metal transactions, give you professional customer service and answer any questions you may have concerning your precious metals transactions. All of our services and weights are performed right in front you. No hidden secrets, just great service. you with an estimate at no charge. If you have a large quantity of precious metal items you can schedule an appointment for a private consultation. WE PAY CASH AND WE WILLL GIVE YOU THE BEST POSSIBLE PRICE! 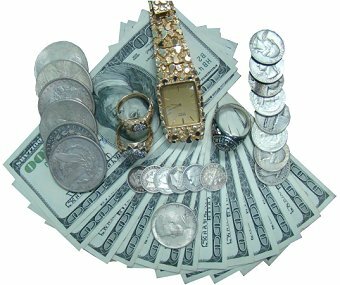 We also have a South Carolina retail license and sell good used jewelry and bullion when available.